Photosynthesis captures energy for life on Earth. Many chemicals are made to allow life processes to occur in plants. These chemicals can move in and out of cells by the process of diffusion. Osmosis is a specific type of diffusion. Photosynthesis is a process used by plants in which energy from sunlight is used to convert carbon dioxide and water into molecules needed for growth. These molecules include sugars, enzymes and chlorophyll. Light energy is absorbed by the green chemical chlorophyll. This energy allows the production of glucose by the reaction between carbon dioxide and water. Oxygen is also produced as a waste product. 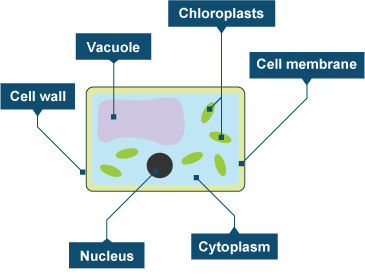 Chloroplasts - containing chlorophyll and enzymes needed for reactions in photosynthesis. Dissolved substances have to pass through the cell membrane to get into or out of a cell. Diffusion is one of the processes that allows this to happen. Diffusiondiffusion: The movement of particles (molecules or ions) from an area of higher concentration to an area of lower concentration occurs when particles spread. They move from a region where they are in high concentration to a region where they are in low concentration. Diffusion happens when the particles are free to move. This is true in gases and for particles dissolved in solutions. Particles diffuse down a concentration gradient, from an area of high concentration to an area of low concentration. This is how the smell of cooking travels around the house from the kitchen, for example. The movement of oxygen and carbon dioxide in and out of leaves during photosynthesis occurs by diffusion. The higher concentration of carbon dioxide in the air diffuses into the leaf for photosynthesis. Oxygen produced during photosynthesis builds up to higher concentrations and diffuses out of the leaf into the air which has a lower concentration of oxygen. Partially permeable membranes let some substances pass through them, but not others. The animation shows an example of osmosis. This is shown in the animation above. Eventually the level on the more concentrated side of the membrane rises, while the one on the less concentrated side falls. When the concentration is the same on both sides of the membrane, the movement of water molecules will be the same in both directions. At this point, the net exchange of water is zero and there is no further change in the liquid levels. Osmosis is important to plants. They gain water by osmosis through their roots. Water moves into plant cells by osmosis, making them turgid [turgid: Having turgor; enlarged and swollen with water ] or stiff so they that able to hold the plant upright. The concentration of minerals in the soil is very low. They dissolve in water and move around the soil in solution. Root hair cells are adapted to absorb the water out of soil byosmosis – they have a large surface area, thin walls and are close to the xylem cells used for transporting water up the plant. Minerals such as nitrate ions cannot be absorbed by osmosis (which is the movement of water only) or diffusion(because the minerals are in very low concentration). The root hair cells have carrier molecules on their surface that pick up the minerals and move them into the cell against the concentration gradient. This requires energy, and is calledactive transport. If you plot the rate of photosynthesis against the levels of these three limiting factors, you get graphs like the ones above. In practice, any one of these factors could limit the rate of photosynthesis. Farmers can use their knowledge of these limiting factors to increase crop growth in greenhouses. They may use artificial light so that photosynthesis can continue beyond daylight hours, or in a higher-than-normal light intensity. The use of paraffin lamps inside a greenhouse increases the rate of photosynthesis because the burning paraffin produces carbon dioxide, and heat too. Energy from light drives photosynthesis. The effect of light levels on plants can be investigated using a number of techniques. 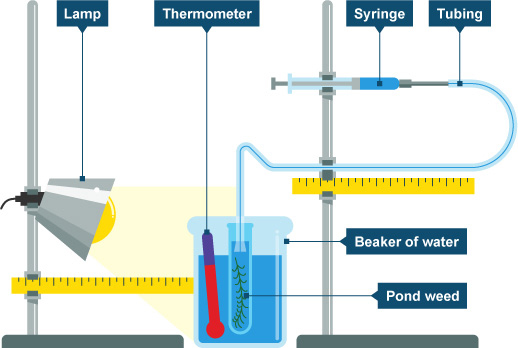 The diagram below shows how apparatus can be set up to investigate the effect of changing light intensity on the rate of photosynthesis. The distance separating the lamp and the pondweed can be altered and the resulting light intensity measured using a light meter. 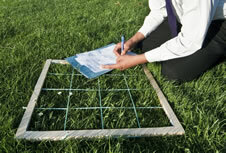 A quadrat can be used to survey the plants present in a square metre. The quadrat is a square grid that is placed on the ground. Any plants or animals present within the area of the quadrat are recorded. The organisms can be named using an identification key that provides pictures and/or descriptions of the organisms. Quadrats are positioned randomly to remove bias and allow for reliable comparison between locations. If appropriate, data may be recorded at regular intervals along a transect. A transect is a straight line that runs through a location upon which data on organism distribution can be recorded. An identification key can then be used to identify species present, so a link may be formed between light level and species present. There are two types of electric current - direct current (DC) and alternating current (AC). An electric current can be produced by moving a magnet inside a coil of wire. The size of this induced current can be increased by moving the magnet faster, by using a stronger magnet, or by increasing the number of turns on the coil and increasing its area. A dynamo is a type of electricity generator. If the current flows in only one direction it is called direct current, or DC. Batteries and solar cells supply DC electricity. A typical battery may supply 1.5V. The diagram shows an oscilloscope screen displaying the signal from a DC supply. If the current constantly changes direction it is called alternating current, or AC. Mains electricity is an AC supply. The UK mains supply is about 230V. It has a frequency of 50Hz (50 hertz), which means that it changes direction and back again 50 times a second. The diagram shows an oscilloscope screen displaying the signal from an AC supply. You should know how to produce an electric current using a coil of wire and a magnet. An electric current is produced when a magnet is moved into a coil of wire in a circuit. We say that the electric current has been induced, and the process is called induction. The direction of the induced current is reversed when the magnet is moved out of the coil again. It can also be reversed if the other pole of the magnet is moved into the coil. Check your understanding of this with this simulation. Notice that no current is induced when the magnet is still, even if it is inside the coil. · increase the area of the coil. It is not practical to generate large amounts of electricity by passing a magnet in and out of a coil of wire. Instead, generators induce a current by spinning a coil of wire inside a magnetic field, or by spinning a magnet inside a coil of wire. As this happens, a potential difference - voltage - is produced between the ends of the coil, which causes a current to flow. One simple example of a generator is the bicycle dynamo. The dynamo has a wheel that touches the back tyre. As the bicycle moves, the wheel turns a magnet inside a coil. This induces enough electricity to run the bicycle's lights. The faster the bicycle moves, the greater the induced current and the brighter the lights. Generators are the devices that transfer kinetic energy into electrical energy. · wave and tidal turbines. 1. The turbine turns a generator. Generators can be turned indirectly using fossil or nuclear fuels. The heat from the fuel boils water to make steam, which expands and pushes against the blades of a turbine. The spinning turbine then turns the generator. 1. Heat is released from fuel and boils the water to make steam. 2. The steam turns the turbine. 3. The turbine turns a generator and electricity is produced. 4. The electricity goes to the transformers to produce the correct voltage. The energy produced by burning fuel is transferred as heat and stored in water as steam. The energy in steam is transferred to movement in a turbine, then to electrical energy in the turbine. Energy is lost to the environment at each stage. Here is a Sankey diagram to show these losses. Note that only about a third of the energy stored in the fuel was transferred as electrical energy to customers. Our renewable energy resources will never run out: their supply is not limited, and there are no fuel costs either. They typically generate far less pollution than fossil fuels. · biomass energy, for example energy released from wood. However, there are somedisadvantages to generating energy from renewable sources: for example, wind farms are noisy and may spoil the view of people who live near them. The amount of electricity generated depends on the strength of the wind. If there is no wind, there is no electricity. There is a limited supply of non-renewable energy resources, which will eventually run out. · nuclear fuels, such as uranium. Fossil fuels release carbon dioxide when they burn, which adds to the greenhouse effect and increases global warming. Of the three fossil fuels, coal produces the most carbon dioxide, for a given amount of energy released, while natural gas generates the least. greenhouse effect: The absorption of heat energy by gases in the atmosphere, especially carbon dioxide and methane. The fuel for nuclear power stations is relatively cheap. But the power stations themselves are expensive to build. It is also very expensive to dismantle old nuclear power stations or store radioactive waste, which is a dangerous health hazard. In an exam question you may be asked to discuss the advantages and disadvantages of methods of large-scale electricity production. You should list both renewable and non-renewable resources with advantages and disadvantages for both. In the 1600s, a scientist called Robert Hooke discovered a law for elastic materials. An elastic material is one that will return to its original shape when the force applied to it is taken away. A plastic (or inelastic) material is one that stays deformed after you have taken the force away. If you apply too big a force a material will lose its elasticity. Hooke discovered that the amount a spring stretches is proportional to the amount of force applied to it. This means if you double the force its extension will double, if you triple the force the extension will triple and so on. The elastic limit can be seen on the graph. This is where the graph stops being a straight line. If you stretch the spring beyond this point it will not return to its original shape. · k is the spring constant (in N/m). Elastic behaviour is very important in car safety, as car seatbelts are made from elastic materials. However, after a crash they must be replaced as they will go past their elastic limit. Why have seat belts that are elastic? Why not just have very rigid seatbelts that would keep you firmly in place? The reason for this, is that it would be very dangerous and cause large injuries. This is because it would slow your body down too quickly. The quicker a collision, the bigger the force that is produced. This can be seen very plainly by comparing the effect of kicking a football, which squashes as you kick it giving a big collision time, followed by kicking a brick. The brick doesn't squash, giving a very quick collision time and a very painful foot. This is why airbags and crumple zones can reduce injuries (these are both parts of a car designed to squash rather than be rigid). So to reduce injuries in a collision, always slow down in as long a time as possible. This is why you bend your legs when landing after a jump and why parachutists roll when they hit the ground. Displacement, velocity, acceleration and force are all vector quantities. The speed of an object can be calculated from the slope on a distance-time graph. The velocity of an object is its speed in a particular direction. The slope on a velocity-time graph represents the acceleration of an object. The distance travelled is equal to the area under a velocity-time graph. 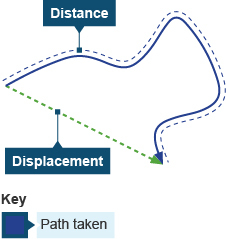 Displacement is the distance travelled in a straight line. It has both a direction and a size. The velocity of an object is its speed in one particular direction. The acceleration of an object is calculated from its change in velocity and the time taken. The force of an object is also a vector as it has a size (measured in Newtons) and a direction. At Key Stage 3, you learned how to calculate the speed of an object from the distance travelled and the time taken. For example, a car travels 300 metres in 20 seconds. Its speed is 300 ÷ 20 = 15m/s. The speed of an object can then be used to calculate the velocity. Check your understanding of this topic by trying this activity. You should be able to draw and explain distance-time graphs for objects moving at steady speeds or standing still. The vertical axis of a distance-time graph is the distance travelled from the start. The horizontal axis is the time from the start. When an object is stationary, the line on the graph is horizontal. When an object is moving at a steady speed, the line on the graph is straight, but sloped. The diagram shows some typical lines on a distance-time graph. Note that the steeper the line, the greater the speed of the object. The blue line is steeper than the red because it represents an object moving faster than the one represented by the red line. The red lines on the graph represent a typical journey where an object returns to the start again. Notice that the line representing the return journey slopes downwards. You should be able to explain velocity-time graphs for objects moving with a constant velocity or constant acceleration. Acceleration: The rate of change of velocity, measured in metres per second squared. Acceleration = change of velocity divided by time taken. The velocity of an object is its speed in a particular direction. This means that two cars travelling at the same speed, but in opposite directions, have different velocities. The vertical axis of a velocity-time graph is the velocity of the object. The horizontal axis is the time from the start. When an object is moving with a constant velocity, the line on the graph is horizontal. When an object is moving with a constant acceleration, the line on the graph is straight, but sloped. The diagram shows some typical lines on a velocity-time graph. The steeper the line, the greater the acceleration of the object. The blue line is steeper than the red line because it represents an object with a greater acceleration. Notice that a line sloping downwards - with a negative gradient - represents an object with a constant deceleration - slowing down. The distance travelled can be calculated from the graph, too. The area under the graph is equal to the distance travelled. Study this velocity-time graph. What is the acceleration represented by the sloping line? The object increases its velocity from 0m/s to 8m/s in 4 s.
Its acceleration is 8 ÷ 4 = 2 m/s2. The width of the rectangle is 6 seconds and the height is 8 metres per second. So the area is 8 × 6 = 48 m.
You should be able to calculate the acceleration. Acceleration:The rate of change of velocity, measured in metres per second squared. Acceleration = change of velocity divided by time taken. of an object from its change in velocity and the time taken. For example, a car accelerates in 5s from 25 m/s to 35 m/s. Its velocity changes by 35 - 25 = 10 m/s. So its acceleration is 10 ÷ 5 = 2 m/s2. Profile: Qualified Teacher since 1982. Over 30 years teaching experience awarded BEd, BEng,GMRINA. Qualifying Teacher Status since 1993 to teach any subject at any-level. Member of the General Teaching Council.MA in Curriculum/Equal Opportunities Studies (Institute of Education, University of London)and MA in Mathematics Education (King's College London). EDEXCEL/AQA Examiner-Marker. Maths,IT,Science,Religious Education Curriculum Leader leading schools to successful inspections. Trained adults,parents and young people. Areas of Expertise:Equal Opportunities,Inclusion,Multiculturalism,Media Studies, Change Management,Health and Safety,Child Protection, Differentiated Planning/Teaching, Project Management, Consulting.Offers Professional Advice to Parents,Trainee/Newly Qualified Teachers on Education.Projects undertaken: Accelarated Learning,Learning through Pair Talk,Challenges in Multicultural Education, Philosophy for Children,Phonics,Education of Newcomers,Work with Special Needs-Autism,Epilepsy, Learning Difficulties-,Gifted Children. Experienced Mathematics, Sciences, Product Design, Media Studies, French and Modern Greek Teacher. Mary Zagoritou. Awesome Inc. theme. Theme images by molotovcoketail. Powered by Blogger.